NEW YORK (CNNMoney) -- JPMorgan Chase Chief Executive Jamie Dimon told Senators on Capitol Hill Wednesday that he cannot defend the trades that led to the bank's massive multi-billion loss. "The way it was contrived between January to March, it changed into something I cannot publicly defend," Dimon told members of the Senate Banking Committee during a two-hour hearing. When asked by Democratic Sen. Sherrod Brown whether he personally approved the trade, Dimon said: "No, I was aware of it, but I didn't approve it." Dimon refused to call the intent of the trade anything other than a hedge to offset other potential risks to the bank. Democratic Sen. Bob Menendez, one of the few committee members to grill Dimon, asked: "So this transaction that you said morphed -- what did it morph into? Russian Roulette?" He also said he wasn't aware of the problems with the trade or the extent of the loss when he called news reports of massive losses from the bank's derivatives positions a "tempest in a teapot" during an April 13 call with analysts. "When I made that statement, I was dead wrong," said Dimon. "Under no event did it look like it would be getting nearly as bad as it got after April 13th." He declined to give any details about the actual trades or the size of JPMorgan's losses, during his testimony but he told CNBC shortly after the hearing that he would offer more information during JPMorgan's second-quarter earnings call on July 13. While Dimon wouldn't defend the trades, JPMorgan's CEO repeatedly called the $2 billion loss "purely management's mistakes." He said, "It would have been very hard for regulators to catch this." Dimon also said it was very "likely" that executives from the firm's chief investment office would be subject to so-called clawback provisions that would allow the bank to take back pay from the past two years. Dimon said he's waiting for the bank to wrap up its investigation of the trade before determining which executives could be subject to clawbacks. Dimon, who has been an outspoken critic of Dodd-Frank financial system reform signed into law in 2010, refused to acknowledge that the legislation had made the financial system any safer. When pushed on the question, he would only say, "I don't know." Dimon defended JPMorgan's size, but urged Congress to build systems that will let big banks fail. Calling it "bankruptcy for big dumb banks," he said "We shouldn't prop them up. We have to allow them to fail." Several Senators asked Dimon for his opinion about how banks could be effectively regulated and how both Dodd-Frank and the Volcker Rule, which limits a bank's ability to trade with its own capital, might be rewritten. Dimon called capital cushions the most important way to keep banks healthy and said that the Volcker Rule won't prevent financial institutions from racking up big losses like JPMorgan's. Dimon stressed that despite the multi-billion dollar loss, the incident was "an isolated event" and that overall, JPMorgan remains "solidly profitable" in its second quarter. Since Dimon first announced the losing trades on May 10, JPMorgan has lost roughly $30 billion of its market value. Shares of JPMorgan have dropped nearly 20% during that same time period. Near the conclusion of his Q&A, Dimon was asked about the U.S. and European economies. He said both have "serious issues." "We have to get our fiscal act together," he said. "The fiscal cliff may not wait until December 31." "If we had done something remotely like Simpson-Bowles, in my opinion, you would have reduced uncertainty about taxes, you would have increased confidence in America, you would have shown a real fix of the long-term fiscal problem," he said. 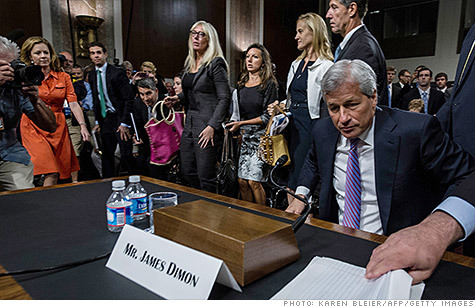 Dimon will return to Capitol Hill next week to field questions from members of the House of Representatives.